Sarajevo is a beautiful city. Today was my first time really exploring and experiencing the sights, scenes and beauty of it. I was captivated by the city. To be completely honest, I have never experienced a city like it before. The first thing that stuck out to me about Sarajevo was the peppering of bullet and shrapnel holes in the walls of nearly all the buildings. Coming from Ontario, Canada, I have never seen such a direct and lasting physical evidence of war. I instantly wanted to know more. Luckily, we were headed towards downtown Sarajevo. Our reason for venturing downtown was to go on a tour with Carolyn Edgerton. Carolyn is a lawyer who was involved in the judicial process to try and convict war criminals from the Bosnian war. Having Carolyn guide my peers and I through the streets of Sarajevo is an experience that I will never forget. Many people have gone on a war tour before, but not many people have been able to go on a war crimes tour with the lawyer who helped convict the criminals involved. Carolyn knew the city, history and trial like the back of her hand. She pointed many things out that even the locals may not have known. I learned so much from the tour, and was able to appreciate the events on a much deeper level. As the focus of the symposium is post-conflict transitions, I believe that this tour was an important aspect of the training. I believe that empathizing with and understanding what the people of Sarajevo went through is a crucial factor of being an effective peacebuilder. It also helps us get a better idea of what is involved in a post-conflict environment. One of the most memorable parts of the tour was ‘the intersection.’ At a certain point in our tour, Carolyn had a video for us to watch. In the video, a group of people were attempting to cross a street. They all seemed afraid and uneasy about crossing. Some were unable to out of fear. After this video, Carolyn told us two things. The first thing was that the people were afraid to cross because there was a sniper who had been shooting at people attempting to cross. This explained why the people were afraid. I thought to myself how awful it would be, to be too afraid to do something as simple as cross the street out of fear of getting shot. Secondly, Carolyn informed us that the intersection near to where we were standing was the same intersection in the video. In that moment, I felt chills. Not all that long ago, the horrible video that we had just witnessed was not just a historical video on a war tour, but the reality for the people of Sarajevo. I will never forget the wave of emotions that came across me in that moment. This moment was one of many that invoked similar emotions. 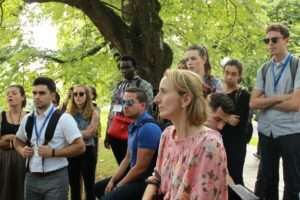 I don’t ever want to forget what I learned on this tour, nor do I want to forget what the innocent people of Sarajevo went through on a day-to-day basis. I will use the knowledge that I learned today and take it with me wherever I go in the world. The tour reminded me that all people matter, all people have worth, and that war does not discriminate in its victims. All are affected and the consequences of unjust war are unfaithful to the preservation of human dignity.